Do you find yourself hungry for action and tasty wins? Come whet your appetite with Big Chef. Since launched in May 2015 by the reputed software developer Microgaming, this 5 x 3 reel and 15 paylines game has gained a solid reputation in the domain of food-themed slots. When playing Big Chef, you will find yourself immersed in the typical atmosphere of a French restaurant. Symbols used include members of the restaurant staff – Chief of course, followed by his server, cook and dishwasher – and different French traditional meals such as a soup bowl or a seafood plate. The sound environment celebrates the arrival of your gains with some local accordion music. The game uses cartoonesque drawings with warm hearted colors, which fits well with the idea of a picturesque Parisian restaurant. The tone is warm and quite humoristic, with for instance a clearly oversized Big Chef seconded by his rather thin and obsequious server. Before getting into your first course, it’s advised to read a bit about the game rules and options. You can do this through 2 different tabs. All winnings, paytables and gains are presented in a rather clear way via the Pays tab on the right side of the screen. Graphic and sound options, as well as help and statistics are provided in a less visible tab on bottom right of the screen. The game can be played for real with a bet per spin ranging from £0.15 to £7.5. Pays on the base game go up to £12500 by aligning 3, 4 or 5 same symbols on the reel, the largest amount being obtained with the ‘BIG Chef’ font symbol which is also a substitute for all lower value symbols. Free spins and bonus features make Big Chef a savoury slot game, pushing gains up to £75.000 which is enough to satisfy the strongest appetite for profits. One free spins can be won with the cloth scatter symbol on reel 5. A minimum of 3 menu scatter symbol in any position on the reel will give you 10 free spins with a 2x gain multiplier. The most interesting bonus is called Raising Wilds, a Microgaming proprietary marks. Raising Wilds consists in a Wild symbol appearing on the reel, then duplicating at each spin on the upper row, leaving a trail of Wilds that will gradually disappears once the top row is reached. The appearance and multiplication of theses Wild symbols greatly improves chances and gain levels. 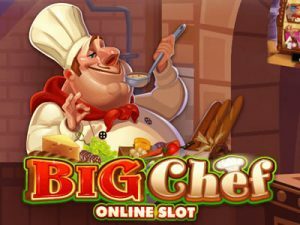 Big Chef offers great treats to his restaurant visitors, enough to please the most discerning palate within the community of online slots gourmets. The game is overall easy to get into and fun to play, and has become a popular game, offered by many online casino at their slots menu. You’ll be able to sit at the Big Chef table in numerous online casino, such as Casino Room, Mr Green, Roxy Palace or GoWild Casino. With the option of a free play taster tryout, all that is left to say is, ”Bon appetite!”.